Believed to have curative qualities, water from Waco’s artesian wells were popular during the late nineteenth and early twentieth centuries. Locals considered the discovery of the artesian water in 1889 one of the most important events in Waco up to that time. Local businessmen took advantage of this new industry and constructed natatoriums for Waco residents and visitors to immerse themselves in the fresh waters. 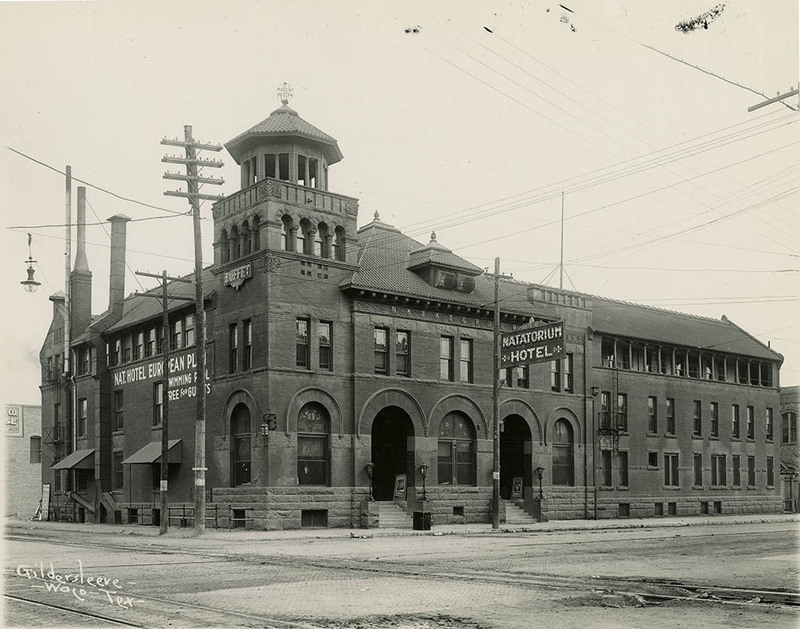 Robert B. Parrott built the Waco Natatorium, also known as the Natatorio-Sanitorium, or Natatorium Hotel, on the corner of Fourth Street and Mary Avenue in 1892. Parrott was a Confederate Army veteran and eager to develop a natatorium with his team of investors. He chose the location of Fourth and Mary because it was right in the center of the city and close to the Cotton Belt depot. Citizens and passengers could visit the natatorium and soak in a thermal bath while waiting on their train rides. It was also only one block from the Provident Building, post office, and Pacific Hotel. The Waco Natatorium opened in the summer of 1892 but fire engulfed the structure on March 20, 1894. Construction for a new building by the Waco Natatorium Company began shortly thereafter. Developers constructed the new Waco Natatorium on a much larger scale, four stories and a rooftop garden. The building featured Spanish-style architecture that fit the style and climate conditions of the state of Texas. To tap into the thermal waters, builders drilled wells as deep as 1,850 feet. The natatorium was equipped with departments for both ladies and gentlemen to have Turkish and Russian baths, individual baths, tubs, vapor rooms, sweat and resting rooms, furnished rooms, a café, offices, and parlors. The natatorium also had one of the largest indoor swimming pools in the South. It was popularly believed that the waters heated deep underground contained minerals that had medicinal qualities producing positive results when people sick with illness or disease bathed in it. Treatment usually consisted of five to fifteen minutes in a tub bath and an additional vapor bath from three to five minutes. However, locals believed it was disastrous for people affected by heart disease or lung problems. One room of the building was known to have dozens of pairs of crutches left behind by people who came to the natatorium needing the walking aids when they came in, but no longer needed them after soaking in the baths. The Waco Natatorium hosted events such as Ladies Night every Monday when the swimming pool was opened exclusively to females. Women wore striped bathing suits that went down below their knees; anything else would have been immodest. In 1913, after the natatorium had been in business for a number of years, fifty new hotel rooms were added. Guests could rent rooms starting at one dollar a night. In August 1893, Parrott’s establishment suffered its first fatality when twelve-year-old Tyler resident Jacob Baruch drowned in the pool while playing with other children during a ladies’ session when Baruch’s mother was taking a Turkish bath. When doctors arrived on the scene, it was too late. Baruch’s father sued the Waco Natatorium for $10,000 alleging negligent supervision of bathers. However, the defense argument was that management was only following the wishes of its female customers in ushering out the men during Ladies Night, even going so far as to prohibit male spectators in the pool room. The Waco Natatorium served as a center of activity in Waco and a downtown attraction for almost forty years. In the 1920s, Waco’s artesian water supply began to run dry because of population growth and high demand for the water. As a result, the wells could no longer provide a constant supply of water for many businesses. The natatorium closed in December of 1926, and burned down on Saturday, January 1, 1927 after it sat empty. Only bare walls marked the spot where the building stood. The natatorium was never rebuilt a second time. 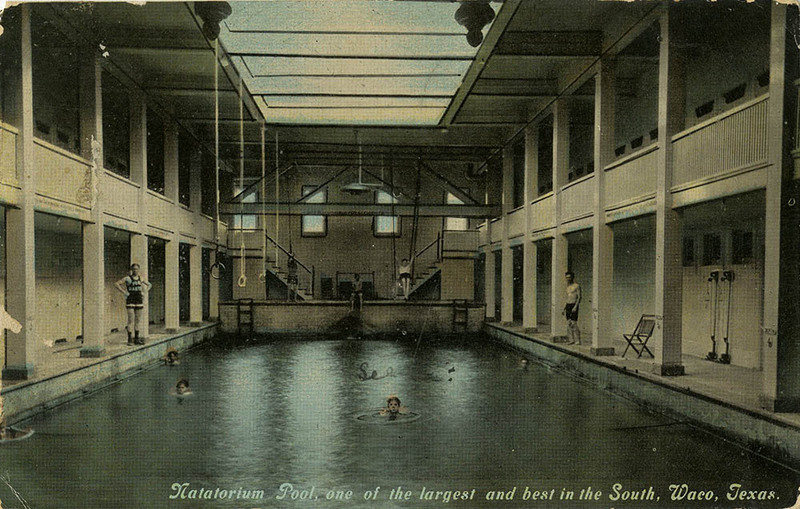 Natatorium Postcard (1910): The Waco Natatorium pool was known as one of the largest and best in the South. 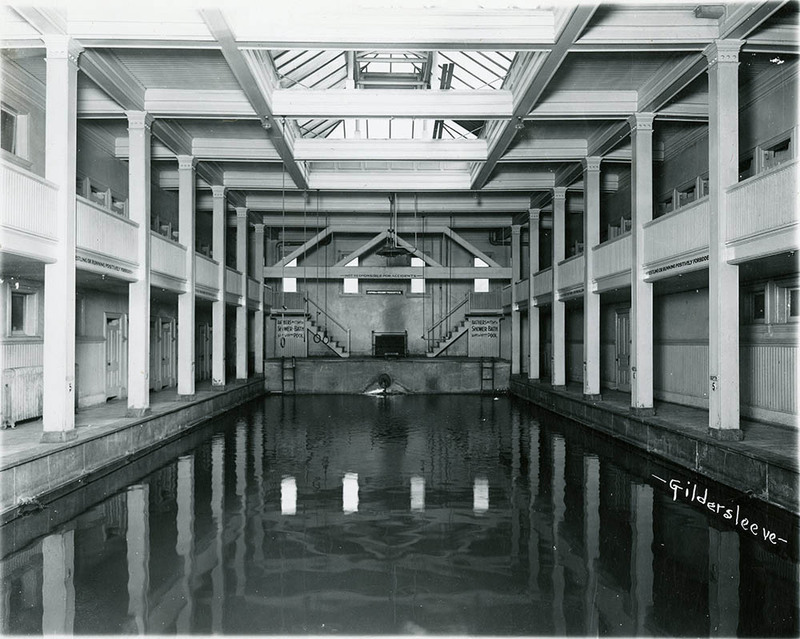 Natatorium Pool (c. 1910): Waco’s first indoor pool. The natatorium pool measured forty by eighty feet, and the depth spanned from three to nine feet at the opposite end. Natatorium Hotel (c. 1910): The four-story Natatorium Hotel had over fifty rooms, and guests could swim in the pool for free. The hotel was known as one of the most equipped bathhouses in the United States. Sarah Miller, “Waco Natatorium,” Waco History, accessed April 26, 2019, https://wacohistory.org/items/show/132. Ryan, Terri Jo. "Brazos Past: Luring Tourists to 'Geyser City.'" Waco Tribune-Herald, June 2, 2012. Cutter, Charles. Cutter's Guide to the City of Waco, Texas. Waco, Texas, 1894. "Natatorium Hotel Destoryed by Fire." Waco Tribune-Herald, January 2, 1927.